Need a challenge? 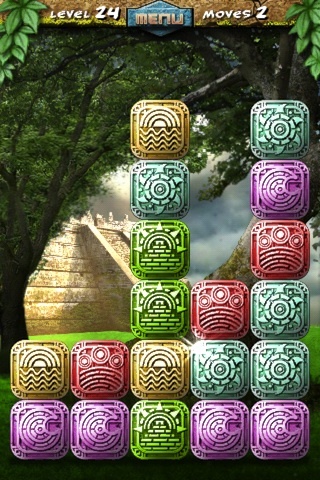 Mayan Puzzle is an iPhone puzzle game from Mind Crew which sells for $0.99 in the App Store. If you’ve ever played match 3 games, you might be quick to assume this is yet another boring match 3 puzzler, and at first look it does look that way. But let me assure you, this is not just another puzzler. You need to think outside the box, analyze, plan ahead, and sometimes just try over and over and over again until you solve a level. Hey it only took me 76 tries, but I did pass the pesky level 19 finally. What’s it all about then you ask? In a similar style to Jewel Craft you get a seemingly random bunch of colored blocks on the screen. You have a set number of given moves to clear the level. Gameplay involves a simple left/right swap trying to get 3 colors to line up either vertically or horizontally, or better yet both to clear them up. Do that for all the blocks on the level and you move on to the next. Solving the levels takes advanced thinking and gets more difficult as you go. As you get to the tougher levles, you will literally have to plan every single move to be able to clear the blocks with the set number of moves allowed. Sometimes the number of blocks are not evenly divisible by three. So for example you might have 5 red blocks, and the only way to clear them up is to have them all touch simultaneously, and this can be sort of a hint in some levels. Speaking of hints, Mind Crew has set up a system in the game that gives you hints to help you solve the puzzle if you get stuck. And believe me you will run into levels where you might get stuck literally for days. Save your hints for those levels. If not you can pay via in app purchases to buy hints to use in the game. I found this feature to be a borderline evil tactic by the developers, especially since you’ve already paid for the game to begin with. The hints cost $0.99 for 3 of them, or $1.99 for 8 levels. In a way I’m actually glad they don’t hand out hints willy nilly, because it forces you to think and figure out the puzzles on your own. Music and sound effects in Mayan Puzzle are like the kind of music you might hear while getting a massage at a spa or something. Very soothing with birds chirping in the background and such. 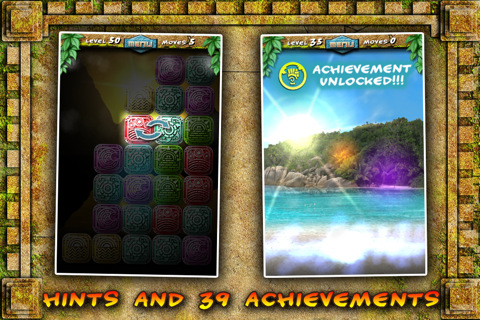 The background of the puzzles have animated scenes featuring Mayan pyramids and lighting effects when you clear blocks. Very dramatic to say the least. Points and achievements are earned based on how many tries it took you to clear a level, and how much time it took you to do so. There are 50 levels total and 39 achievements to rack up. Play in classic mode, or if you get tired of that you can try time trial, challenge and marathon as well. In these other 3 modes you’re not limited to a number of moves. You can also swipe up to get a new row of blocks added to the mix if you get stuck. Here are some Mayan Puzzle Cheats for solving the really difficult levels. Don’t read beyond this point if you want to figure them out for yourself. Level 19 – Move the top green brick left twice. Move the middle turquoise brick left. Level 23 – Move the top green brick right 3 times. Move the bottom red brick left once. Level 24 – Move the top turquoise brick right once. Move the bottom red brick right twice. Move the top red brick left once. Level 25 – Move the top blue brick left. Move the right blue brick on the 3rd row left. Move the blue brick on the second row left. Move the last blue brick on the 3rd row left. Move the green brick on the bottom row left. Level 26 – Move the bottom red brick left twice. Move the yellow brick on the 3rd row right. Move the purple brick on the second row left. Move the green brick on the bottom row right. Level 27 – (6 Moves) Swap the Blue and Yellow bricks on the 5th row from top. Swap the blue and red bricks on the right side of the 6th row. Now swap the blue and yellow bricks on the 5th row. Swap the blue and purple bricks on the bottom row. Move the middle green brick right on the bottom row. Finally, move the blue brick right on the same bottom row. Level 28 – (6 Moves) Move the purple brick left on the 2nd row from top. Move the purple brick right on the 3rd row. Move the yellow brick left on the 5th row. Move the turquoise brick right on the 4th row from top. Move the far left purple brick right and drop down on the 4th row. Now move the turquoise brick left on the bottom row. Level 29 – (5 Moves) Move the turquoise brick right on the 2nd row from top. Move the green brick left on the top row. Move the right red brick left on the 4th row. Move the red brick right on the 5th row. Move the right red brick left on the 6th row. Level 30 – (5 Moves) Move the blue brick right on the 2nd row from top. Move the green brick right on the 5th row. Move the yellow brick right on the 4th row from top. Move the purple brick right on the bottom row. Level 31 – (5 Moves) Move the blue brick right on the 3rd row from top. Move the yellow brick right on the 3rd row from top. Move the left purple brick right two times on the 4th row from top. Move the yellow brick right on the bottom row. Level 31 – (5 Moves) Move the red brick right on the 2nd row from top. Move the blue brick right on the 2nd row. Move the green brick right two times on the 4th row. Move the turquoise brick left on the 4th row. Overall, Mayan Puzzle is an absolute must have puzzle game if you enjoy thinking puzzlers. It’s a particularly remarkable puzzler with addictive mind teasing entertainment perfect for the iPhone. AppSafari review of Mayan Puzzle was written by Joe Seifi on January 28th, 2011 and categorized under App Store, Featured, Fun, Games, Puzzler. Page viewed 6098 times, 3 so far today. Need help on using these apps? Please read the Help Page.